Thanks to barnesandnoble.com for this cover image to Johnny Boo. The versatile cartoonist, James Kochalka has presented delighted readers with a variety of diverse comic books. There’s his scatological teen superhero comic book series, Super F*ckers (something like an animated version of Larry Clark’s film, Kids). His surreal, Disney-esque Monkey Vs. Robot books have had multiple printings. Conversations, his trippy jam comic books with cartoonist Jeffrey Brown, are filled with glorious talk. His webcomic, American Elf (collected in two books with a third on the way), is a delightful and colorful cartoon journal that presents the eccentric, but often normal life of a young family (Kochalka’s own) and their unconventional friends and associates. Now, however, Kochalka’s latest book joins his publisher, Top Shelf Productions’ growing list of “all ages” or kids’ comics (which includes the Owly series, Korgi, and Yam). Johnny Boo: The Best Little Ghost in the World follows an eventful afternoon in the life of Johnny Boo, a Casper-like ghost, and his pet Squiggle, a tiny teardrop shaped ghost. A trip to find Johnny’s secret ice cream stash brings them into contact with … an ICE CREAM MONSTER! 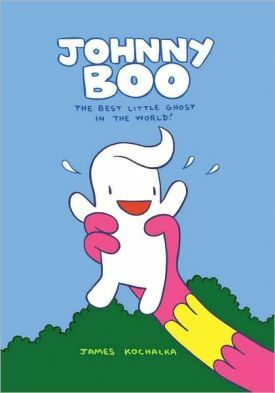 Johnny Boo: The Best Little Ghost in the World is a cross between a hardcover children’s picture book and a single-issue comic book. Imagine a favorite issue of Casper or Richie Rich published as a small hardback with bright four-color interiors. Although this book is for children under 10-years of age, even older readers can like its sweet, playful ambiance – like an afternoon game of hide-and-seek. Actually, Johnny Boo belongs less in a comic book store and more in a bookstore sitting on a shelf in the wonderful world of children’s books.